The ancient Greek hoplites used individual insignia on their shields. The ancient Romans used similar insignia on their shields, but these identified military units. Heraldic designs came into general use among western nobility in the 12th century. Systematic, heritable heraldry had developed by the beginning of the 13th century. Exactly who had a right to use arms, by law or social convention, varied to some degree between countries. Early heraldic designs were personal, used by individual noblemen (who might also alter their chosen design over time). Arms become hereditary by the end of the 12th century, in England by King Richard I during the Third Crusade (1189–1192). The term coat of arms itself in origin refers to the surcoat with heraldic designs worn by combattants, especially in the knightly tournament, in Old French cote a armer. The sense is transferred to the heraldic design itself in Middle English, in the mid-14th century. Despite no widespread regulation, heraldry has remained consistent across Europe, where tradition alone has governed the design and use of arms. Some nations, like England and Scotland, still maintain the same heraldic authorities which have traditionally granted and regulated arms for centuries and continue to do so in the present day. In England, for example, the granting of arms is and has been controlled by the College of Arms. Unlike seals and other general emblems, heraldic "achievements" have a formal description called a blazon, which uses vocabulary that allows for consistency in heraldic depictions. In the present day, coats of arms are still in use by a variety of institutions and individuals: for example, many European cities and universities have guidelines on how their coats of arms may be used, and protect their use as trademarks. Many societies exist that also aid in the design and registration of personal arms. Heraldry has been compared to modern corporate logos. In the heraldic traditions of England and Scotland, an individual, rather than a family, had a coat of arms. In those traditions coats of arms are legal property transmitted from father to son; wives and daughters could also bear arms modified to indicate their relation to the current holder of the arms. Undifferenced arms are used only by one person at any given time. Other descendants of the original bearer could bear the ancestral arms only with some difference: usually a colour change or the addition of a distinguishing charge. One such charge is the label, which in British usage (outside the Royal Family) is now always the mark of an heir apparent or (in Scotland) an heir presumptive. Because of their importance in identification, particularly in seals on legal documents, the use of arms was strictly regulated; few countries continue in this today. This has been carried out by heralds and the study of coats of arms is therefore called "heraldry". In time, the use of arms spread from military entities to educational institutes, and other establishments. The Queen of Canada has delegated her prerogative to grant armorial bearings to the Governor General of Canada. Canada has its own Chief Herald and Herald Chancellor. The Canadian Heraldic Authority is situated at Rideau Hall. The Great Seal of the United States uses on the obverse as its central motif an heraldic achievement described as being the arms of the nation. 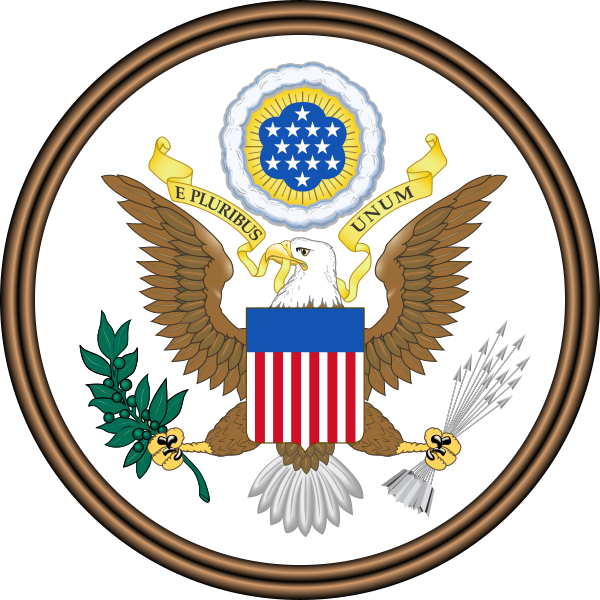 The seal, and the armorial bearings, were adopted by the Continental Congress on 20 June 1782, and is a shield divided palewise into thirteen pieces, with a blue chief, which is displayed upon the breast of an American bald eagle. The crest is thirteen stars breaking through a glory and clouds, displayed with no helm, torse, or mantling (unlike most European precedents). Only a few of the American states have adopted a coat of arms, which is usually designed as part of the respective state's seal. Vermont has both a state seal and a state coat of arms that are independent of one another (though both contain a pine tree, a cow and sheaves of grain); the seal is used to authenticate documents, whilst the heraldic device represents the state itself. The Vatican City State and the Holy See each have their own coat of arms. As the papacy is not hereditary, its occupants display their personal arms combined with those of their office. Some popes came from armigerous (noble) families; others adopted coats of arms during their career in the Church. The latter typically allude to their ideal of life, or to specific pontifical programmes. A well-known and widely displayed example in recent times was Pope John Paul II's arms. His selection of a large letter M (for the Virgin Mary) was intended to express the message of his strong Marian devotion. Roman Catholic dioceses are also each assigned a coat of arms, as are basilicas or papal churches, the latter usually displaying these on the building. These may be used in countries which otherwise do not use heraldic devices. In countries like Scotland with a strong statutory heraldic authority, arms will need to be officially granted and recorded. With the formation of the modern nation states of the Arab World in the second half of the 20th century, European traditions of heraldry were partially adopted for state emblems. These emblems often involve the star and crescent symbol taken from the Ottoman flag. Another commonly seen symbol is the eagle, which is a symbol attributed to Saladin, and the hawk of the Qureish. These symbols can be found on the Coat of Arms of Egypt and Syria. ^ Stephen Friar (ed. ), A New Dictionary of Heraldry, London 1987. Alphabooks/A&C Black. ISBN 0-906670-44-6. P. 96. ^ a b "Educational Institute Coat of arms". October 2005. Retrieved 26 August 2015. ^ "Policy on use of the Workmark and Insignia of McGill University" (PDF). 2000. Archived from the original (PDF) on 26 February 2015. Retrieved 26 August 2015. ^ Employee Identification with the Corporate Identity International Studies of Management and Organization, Volume 32, Number 3, 2002 "Group Identity Formation in the German Renaissance". 20 August 2002. Retrieved 26 August 2015. ^ Volborth, Carl-Alexander von (1981). Heraldry: Customs, Rules and Styles. Poole, England: Blandford Press. ISBN 0-7137-0940-5. ISBN 0-7137-0940-5 p.129. ^ "The History of Heraldry in Canada". Royal Heraldry Society of Canada. 28 April 2004. Archived from the original on 6 March 2009. Retrieved 21 August 2008. ^ "The Canadian Heraldic Authority". Canadian Heraldic Authority. 2015. Retrieved 26 August 2015. ^ "2004 Seal Broch" (PDF). July 2003. Retrieved 26 August 2015. ^ "Coat of arms of His Holiness Benedict XVI". 2015. Retrieved 26 August 2015. ^ "Vatican press office". 9 June 2013. Retrieved 27 August 2015. ^ "Coat of Arms (Eagle of Saladin)". Macaulay Honors College. 5 April 2011. Retrieved 19 August 2015. This gallery of sovereign state coats of arms shows the coat of arms, an emblem serving a similar purpose or both (such as greater and lesser coat of arms, national emblem or seal) of each of the countries in the list of countries. The Arms of Canada (French: armoiries du Canada), also known as the Royal Coat of Arms of Canada (French: armoiries royales du Canada) or formally as the Arms of Her Majesty The Queen in Right of Canada (French: Armoiries de Sa Majesté la Reine du chef du Canada), is, since 1921, the official coat of arms of the Canadian monarch and thus also of Canada. It is closely modelled after the royal coat of arms of the United Kingdom with French and distinctive Canadian elements replacing or added to those derived from the British version. The maple leaves in the shield, blazoned "proper", were originally drawn vert (green) but were redrawn gules (red) in 1957 and a circlet of the Order of Canada was added to the arms for limited use in 1987. The shield design forms the monarch's royal standard and is also found on the Canadian Red Ensign. The Flag of the Governor General of Canada, which formerly used the shield over the Union Flag, now uses the crest of the arms on a blue field. The arms are embossed on the covers of Canadian passports, in order to legally signify and symbolize that the bearer is travelling under the aid of the Crown of Canada. Brașov (Romanian pronunciation: [braˈʃov] (listen), Latin: Corona, German: Kronstadt, Transylvanian Saxon: Kruhnen, Hungarian: Brassó) is a city in Romania and the administrative centre of Brașov County. According to the latest Romanian census (2011), Brașov has a population of 253,200 making it the 7th most populous city in Romania. The metropolitan area is home to 382,896 residents.Brașov is located in the central part of the country, about 166 kilometres (103 miles) north of Bucharest and 380 kilometres (236 miles) from the Black Sea. It is surrounded by the Southern Carpathians and is part of the historical region of Transylvania. The city is notable for being the regional capital of the Transylvanian Saxons of the Burzenland administrative area in the past, and a large commercial hub on the trade roads between East and West. It is also the birthplace of the national anthem of Romania. Canting arms are heraldic bearings that represent the bearer's name (or, less often, some attribute or function) in a visual pun or rebus. The term was derived from the Anglo-Norman cant, meaning song or singing. Canting arms – some in the form of rebuses – are quite common in German civic heraldry. They have also been increasingly used in the 20th century among the British royal family. When the visual representation is not straightforward but as complex as a rebus, this is sometimes called a rebus coat of arms. An in-joke among Society for Creative Anachronism heralds is the pun, "Heralds don't pun; they cant." The coat of arms of Ireland is blazoned as Azure a Celtic Harp Or, stringed Argent (a gold harp with silver strings on a blue background). These arms have long been Ireland's heraldic emblem. References to them as being the arms of the king of Ireland can be found as early as the 13th century. These arms were adopted by Henry VIII of England when he ended the period of Lordship of Ireland and declared Ireland to be a kingdom again in 1541. When the crowns of England, Scotland and Ireland were united in 1603, they were integrated into the unified royal coat of arms of kingdoms of England, Scotland and Ireland. The harp was adopted as the emblem of the Irish Free State when it separated from the United Kingdom in 1922. They were registered as the arms of Ireland with the Chief Herald of Ireland on 9 November 1945.The depiction of the harp has changed over time. In the 17th century, during the period of the Kingdom of Ireland, the pillar of the harp began to be depicted as a bare-breasted woman. When the arms were restored as the arms of the independent Irish state in 1922, a late-medieval Gaelic harp (a cláirseach), the Trinity College Harp, was used as a model. Several variants of the arms of Ireland exist, including a heraldic badge and an infrequently used crest and torse. The Lordship of Ireland, the medieval realm of Ireland that existed between 1171 and 1541 under the English crown, had a separate arms, which are blazoned Azure, three crowns in pale Or, bordure Argent (three golden crowns ordered vertically on a blue background with a white border). A variant of the arms of the ancient royal province of Meath were also apparently used at one time as the arms of Ireland. The coat of arms of Poland is a white, crowned eagle with a golden beak and talons, on a red background. In Poland, the coat of arms as a whole is referred to as godło both in official documents and colloquial speech, despite the fact that other coats of arms are usually called an herb (e.g. the Nałęcz herb or the coat of arms of Finland). 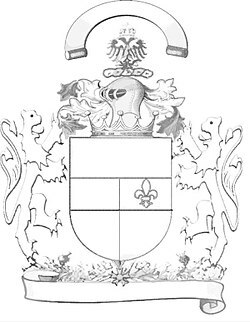 This stems from the fact that in Polish heraldry, the word godło (plural: godła) means only a heraldic charge (in this particular case a white crowned eagle) and not an entire coat of arms, but it is also an archaic word for a national symbol of any sort. In later legislation only the herb retained this designation; it is unknown why. The coat of arms of the Russian Federation derives from the earlier coat of arms of the Russian Empire which was abolished with the Russian Revolution in 1917 and restored in 1993 after the constitutional crisis. Though modified more than once since the reign of Ivan III (1462–1505), the current coat of arms is directly derived from its mediaeval original, with the double-headed eagle having Byzantine and earlier antecedents from long before the emergence of any Russian state. The general tincture corresponds to the early fifteenth-century standard. The shape of the eagle can be traced back to the reign of Peter the Great (1682–1725), although the eagle charge on the present coat of arms is golden rather than the traditional, imperial black. The coat of arms of the BBC was adopted in March 1927 to represent the purpose and values of the corporation. It is seldom used nowadays except for ceremonial purposes. The Coat of arms of the Philippines (Filipino: Sagisag ng Pilipinas)(Spanish: Escudo de Filipinas) features the eight-rayed sun of the Philippines with each ray representing the eight provinces (Batangas, Bulacan, Cavite, Manila, Laguna, Nueva Ecija, Pampanga and Tarlac) which were placed under martial law by Governor-General Ramón Blanco during the Philippine Revolution, and the three five-pointed stars representing the three primary geographic regions of Luzon, Visayas, and Mindanao. The Saudi Arabian national emblem (Arabic: شعار السعودية‎) was adopted in 1950. According to the Saudi Basic Law, it consists of two crossed swords with a palm tree in the space above and between the blades. The two swords represent the Kingdom of Hejaz and the Sultanate of Najd and its dependencies, which were united under Ibn Saud in 1926. The palm tree represents the Kingdom's assets which are defined as its people, heritage, history, and resources natural and non-natural. Thus, the palm is shown to be guarded by the two swords, which represent the forces to be used in defence of the nation. The Great Seal of the United States is used to authenticate certain documents issued by the federal government of the United States. The phrase is used both for the physical seal itself, which is kept by the United States Secretary of State, and more generally for the design impressed upon it. The Great Seal was first used publicly in 1782. The obverse of the Great Seal is used as the national coat of arms of the United States. It is officially used on documents such as United States passports, military insignia, embassy placards, and various flags. As a coat of arms, the design has official colors; the physical Great Seal itself, as affixed to paper, is monochrome. Since 1935, both sides of the Great Seal have appeared on the reverse of the one-dollar bill. The Seal of the President of the United States is directly based on the Great Seal, and its elements are used in numerous government agency and state seals. The złoty (pronounced [ˈzwɔtɘ] (listen); sign: zł; code: PLN), which is the masculine form of the Polish adjective 'golden', is the currency of Poland. The modern złoty is subdivided into 100 groszy (singular: grosz; alternative plural form: grosze). The recognised English form of the word is zloty (plural: zloty or zlote). The currency sign, zł, is composed of the Polish lower-case letters z and ł (Unicode: U+007A z LATIN SMALL LETTER Z & U+0142 ł LATIN SMALL LETTER L WITH STROKE). As a result of inflation in the early 1990s, the currency underwent redenomination. Thus, on 1 January 1995, 10,000 old złotych (PLZ) became one new złoty (PLN). Since then, the currency has been relatively stable, with an exchange rate fluctuating between 3 and 4 złoty for a United States dollar. In the standard variant used outside of Scotland, the shield is quartered, depicting in the first and fourth quarters the three passant guardant lions of England; in the second, the rampant lion and double tressure flory-counterflory of Scotland; and in the third, a harp for Ireland. The crest is a statant guardant lion wearing the St Edward's Crown, himself on another representation of that crown. The dexter supporter is a likewise crowned English lion; the sinister, a Scottish unicorn. According to legend a free unicorn was considered a very dangerous beast; therefore the heraldic unicorn is chained, as were both supporting unicorns in the royal coat of arms of Scotland. In the greenery below, a thistle, Tudor rose and shamrock are depicted, representing Scotland, England and Ireland respectively. This armorial achievement comprises the motto, in French, of English monarchs, Dieu et mon Droit (God and my Right), which has descended to the present royal family as well as the Garter circlet which surrounds the shield, inscribed with the Order's motto, in French, Honi soit qui mal y pense (Shame on him who thinks evil). Quarterly, first and fourth Gules three Lions passant gardant in pale Or armed and langued Azure (for England), second quarter Or a Lion rampant within a double tressure flory-counter-flory Gules (for Scotland), third quarter Azure a Harp Or stringed Argent (for Ireland), the whole surrounded by the Garter; for a Crest, upon the Royal helm the Imperial Crown Proper, thereon a Lion statant gardant Or imperially crowned Proper; Mantling Or and Ermine; for Supporters, dexter a Lion rampant gardant Or crowned as the Crest, sinister a Unicorn Argent armed, crined and unguled Proper, gorged with a Coronet Or composed of Crosses patées and Fleurs-de-lis a Chain affixed thereto passing between the forelegs and reflexed over the back also Or. Motto "Dieu et mon Droit" in the compartment below the shield, with the Union Rose, Shamrock and Thistle engrafted on the same stem. Târgoviște (alternative spelling: Tîrgoviște; Romanian pronunciation: [tɨrˈɡoviʃte]) is a city in Romania, and the county seat of the Dâmbovița County. It is situated on the right bank of the Ialomița. At the 2011 census Târgoviște had a population of 79,610, making it the 26th largest city in Romania. One of the most important cities in the history of Wallachia, it was its capital between the early 15th century and the 16th century.